Properties: *exceptional washing results, even at low temperatures. *suitable for all coloureds. *plant based formulation. *respects and naturally cares for your skin . *not based on petrochemical ingredients. *no optical brighteners. Optical brighteners irreversibly bond with the skin. *fragrance free. *no enzymes. *approved by The Vegan Society. *optimum level of biodegradability far exceeds legal requirements. *minimum impact on aquatic life. *against animal testing. *also suitable for septic tanks. 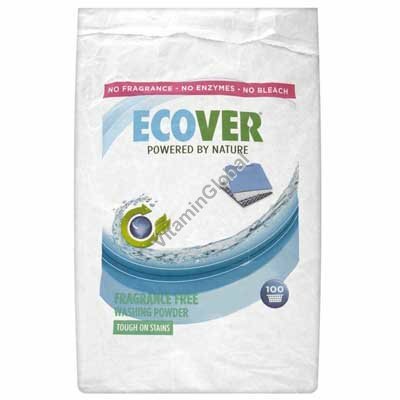 Instructions for use: Ecover Non Biological Washing Powder is recommended for coloureds and is economical to use. For whites and colourfast laundry: add Ecover Ecological Bleach. For a load of normally soiled laundry just add 2/3 scoop (83 ml) per load. Run your machine as per the manufacturers instructions. Increase the dose for heavily soiled laundry and for hard water. Decrease the dose for soft water. Ecover Non Biological Washing Powder is also great for handwashing. Just dissolve 1/3 scoop in 5 litres of warm water. Wash and rinse your clothes as normal. Ingredients:The list below displays ingredients in descending order, with those present in highest quantities coming first. Packaging material: Carton bag is made of 95 % recycled cardboard.